Click here to download "Unmasking the Jesuits" Click here to download "Unmasking the New World Order" it. These files are only 5MB and can on be shared on a email! Taking the mask off Communisism, the mask created by the Jesuits, their mask for world control, for promoting the New World Order. To understand how President Obama's administration may fit in to the Vatican's agenda, it is, I think, necessary to cover briefly the record of Marxism in this country, since our current President is so often accused of having Socialist and/or Communist leanings. One of the darkest periods in America's history was the McCarthy era in which a modern day Inquisition was set up to search out Communists, who were effectively know as the political "heretics" of the time. 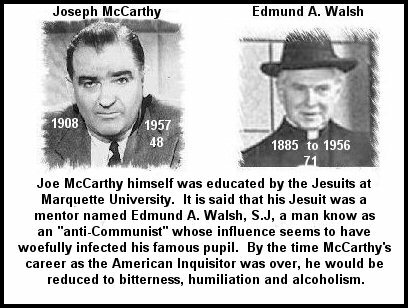 What few people today know, however, is that Senator Joseph McCarthy was directly influenced by the Jesuit Order to begin his political movement that would operate with all the unreasonable zealousness that Rome's historic Inquisition was known for. ...(in October, 1949) Cardinal Spellman was summoned to Rome by the Pope, with whom he had repeated and prolonged private sessions. Although giving rise to sharp speculation, it remained a well guarded secret. The new Catholic Secretary of the U.S. Navy (Francis Matthews", strangely enough, soon afterwards began unusually active contacts with other prominent American Catholics. Among these, Father Walsh, Jesuit Vice-President of Georgetown University; Cardinal Spellman, the head of the American Legion; the leaders of the Catholic War Veterans and with Senator McCarthy, the arch-criminal senator, who upon the advice of a Catholic priest, was just beginning his infamous campaign which was to half paralyze the U.S. for some years to come." 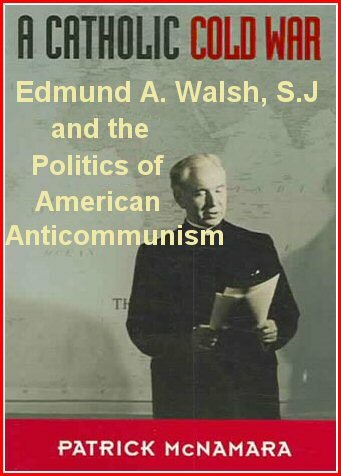 The Book "A Catholic Cold War "featuring Edmund A. Walsh (McCarthy's Jesuit) on the front cover, asserting that America's Cold War with the Soviet Union was inspired by the Jesuit Order. Quickly realizing what a formidable task it would be to consider Walsh's career as a whole, I chose instead to concentrate here on his anticommunism. 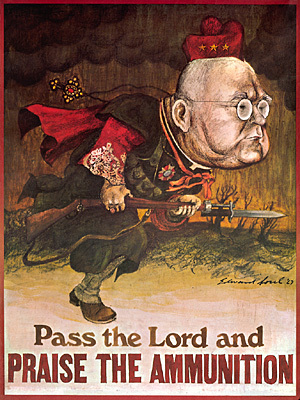 After he returned from Russia in January 1924, Walsh spent the next four decades warning the American public about the moral and political threat that Soviet communism posed to the inter national community. By late 1952, when a stroke ended his public career, his anticommunist campaign amounted to four books and dozens of articles on the Soviet Union, as well as nearly two thousand lectures on this subject. No other Catholic anticommunist could claim such a record. The Novus Ordo Seclorum on the Great Seal of the United States is governed by the all-seeing-eye in a triangle, with light blazing around it. While some have called this the "eye of Horus," in reality, the Egyptian god never had his eye surrounded by a triangle with light in this manner. The earliest know origins for that particular symbol are in Roman Catholic churches across Europe. Aachen Cathedral, built in the eighth century A.D. by the Emperor Charlemagne, features the eye prominently, while variations of it were also used on the frontispieces of Jesuit writings centuries before the American Revolution. How conspiracy writers have failed to make this connection, which becomes painfully obvious with just a little bit of research, we can only wonder at. Yet the other side of the Great Seal featuring the American eagle becomes just as Jesuitical when one examines the seal of Georgetown University. 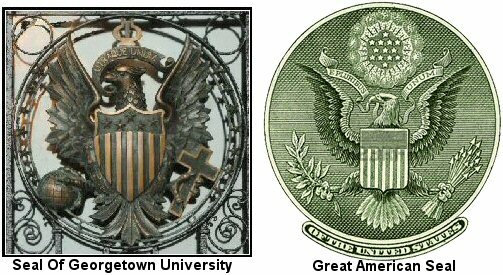 On the image below, notice that the design of the Georgetown eagle is nearly identical to what appears on the reverse of the U.S. dollar. The key differences between the Great Seal and the Jesuit Seal are the phrases above the eagle's head, along with what the eagle holds in its talons: and herein lies the key to Jesuit ambitions. In one talon of the Georgetown eagle is the cross, which is an obvious symbol for Christianity, but being that this is a Jesuit university, it can only symbolize the Church of Rome. Meanwhile, the other talon clutches a globe. Above the eagle's head is the phrase, "Utraque Unum," which means, "Both are one." In other words, the phrase symbolizes the unification of the cross & the globe–or rather, the Roman Catholic Church with the whole world. When one considers that Georgetown University was founded in 1789, and their seal generated a short time later, we can only conclude that the Jesuit's goal in the United States from the beginning has been to use this country to accomplish their centuries-old agenda. There was a time in our nation's history when this was better know than it is today. 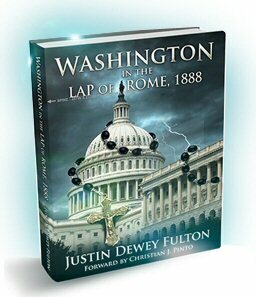 "In early nineteenth-century America, Protestant opposition and hatred of Jesuits was pithily expressed: They (the Jesuits) will bring Rome to rule the Union." pithily 1. Precisely meaningful; forceful and brief: a pithy comment. To Purchase click on the Book.